Bayalas was recognized for her contribution in safely delivering an estimated 2,000 babies in her hometown of San Fernando, Cebu on Wednesday, March 27. Bayalas started her own birthing clinic when she was 22. But before she could put up her clinic, she encountered difficulties that hampered her goals. 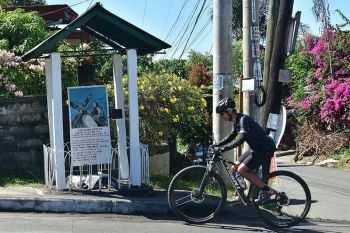 “Ever since I was a child, I really wanted to have my own birthing clinic after seeing how hard it was to bear children in a mountanious barangay in our town. So I told myself that if I could pass the midwifery board exam, I would do it,” she said. In 2012, she passed the exam and turned a two-room apartment near the public market in San Fernando into a birthing clinic called Balayas Birthing Home and Family Planning Services. Through the help of the owner of another birthing clinic where she served as an on-the-job trainee, Bayalas managed to start her business using P5,000 as capital. “The founder of Integrated Midwives Association of the Philippines-Cebu Midwife Clinic Inc. saw the potential in me, and she believed that I could do it, so she provided me with all the tools and equipment,” she said. 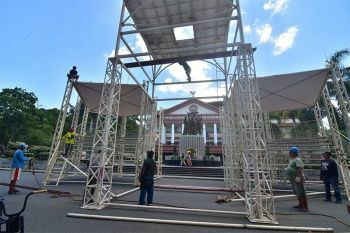 For about a year, while waiting for the accreditation from Philippine Health Insurance Corp. (Philhealth), Bayalas would singlehandedly offer pre-natal checkups to pregnant mothers, free of charge. “People living in the mountains are not aware of the importance of pre-natal checkups for them and for their babies. They undergo labor and delivery in their homes, and we know that entails a lot of risks, not only for the mother, but also the baby. I offered it to them for free because I knew they could barely pay for the vitamins,” she said. 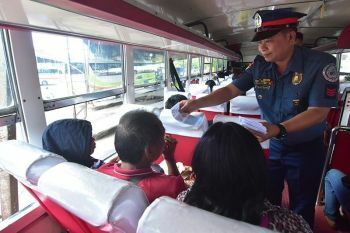 Glenda Canoy, 39, one of the mothers who availed of the services of the Philhealth-accredited clinic, attested to Balayas’s expertise. “Bisan gamay siya nga pagkababay, maayo kay siya moatiman ug manabang (Even if she’s a small woman, she knows how to take care of you during labor and delivery),” she said. After hearing the opportunities in micro-finance entrepreneurship, Bayalas then ventured to avail herself of a loan from the Ramon Aboitiz Foundation Inc. Micro-finance in the amount of P20,000. She opened Tindahan ni Gracia, a sari-sari store in the farflung barangay of Bugho, to support her clinic in 2016. Bayalas’s account officer in Rafi Micro-finance Inc., Lafe Caño, said the midwife has a good track record in her lending transactions. “She doesn’t have any problem at all when it comes to payments,” she said. As the CMA Youth Entrepreneur of the Year, Bayalas received a P100,000 cash prize, a laptop, life and health insurance coverage for a year, and access to grassroots entrepreneurship management and basic computer training at the Citi Microenterprise Development Center, a Citi Foundation program in partnership with Bayan Academy. The CMA program is an initiative of the Citi Foundation in partnership with the Bangko Sentral ng Pilipinas (BSP), Citi Philippines, and the Microfinance Council of the Philippines Inc. (MCPI). 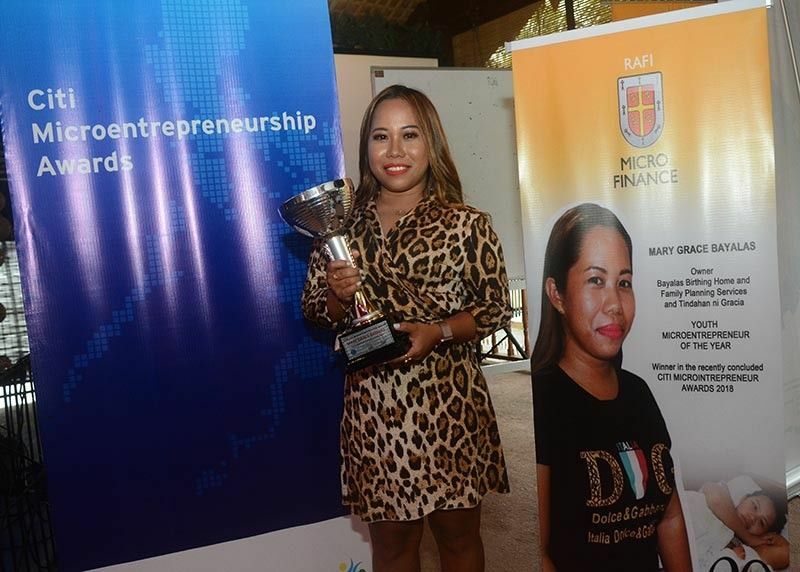 June Hamoy, MCPI program consultant for the CMA, said the recognition of microentrepreneurs raises awareness on microfinance and financial inclusion. “Because we have winners, we have successful faces of microfinance development. Microentrepreneurs hire people, so they generate jobs and contribute to the national economy,” she said. Bayalas currently has two workers who help her at the clinic. From just two beds, she now has seven. She plans to bring her services to another far-flung village so she can reach poor mothers in another community that need her services.